Wear something that is tight fitting over the shoulders, hips, knees and ankles. Tight fitting Lycra cycle clothing is perfect. Or a vest style top with bare shoulders. If you use padded cycle shorts, please make sure you wear these as we want to get the fit as accurate as possible. Bring the shoes you would normally go out riding in. If you have various pairs of cycling footwear, please bring them with you. We can check your cleat set up for you. Please bring in a well maintained, clean bike. If you are bringing a MTB or Cyclo cross bike, it would be beneficial to have a slick tyre on the rear wheel. If you are having the fit on the Müve bike, please tell us the type of pedal you typically use. Over a cup of coffee, we will find out about your riding type and experience, your future goals and expectations, past achievements and any previous bike related issues. We then move on to a …. This will highlight any biomechanical and physiological restrictions we need to be aware of whilst on the bike. Examples include hamstring flexibility, ankle range of movement, foot alignment etc. A snap shot of your current bike position and a digitally mapped measurement of your current bike set up is taken using the Retül ‘Zin’ Tool. 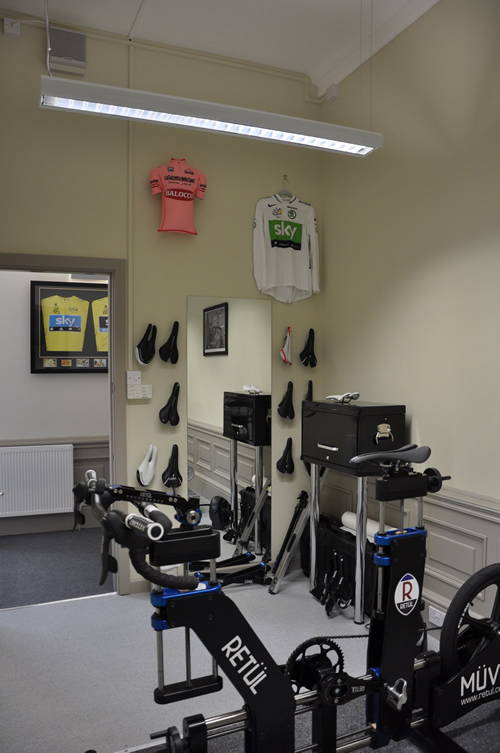 This enables us to see a complete ‘before bike fit’ view compared to the post fit view. Whilst you are sitting on your own bike or the Müve bike, we place Velcro markers on 8 anatomical points of the body and attach LED sensors to these markers. It is these sensors that transmit data about your 3D body angles in real time to the Retül sensor. These sensors are put on both sides of the body, so we can build up a whole body picture. Under a specified load, you start to ride. Whether on your own bike or the Müve bike, we control the level of difficulty. The ride should be about 70% of maximal in order to get a realistic level of cycling. As you pedal, the sensor bar gathers and displays on a large screen, real time 3D data of your body angles, lateral and vertical movements. Adjustments are made depending on the data gathered and interpreted by your bike fitters. Stages 7, 8 and 9 are repeated until your ideal bike position has been achieved. A snapshot of your new position is taken and a final digitally mapped measurement of your bike set up using the ‘Zin’ tool is taken. 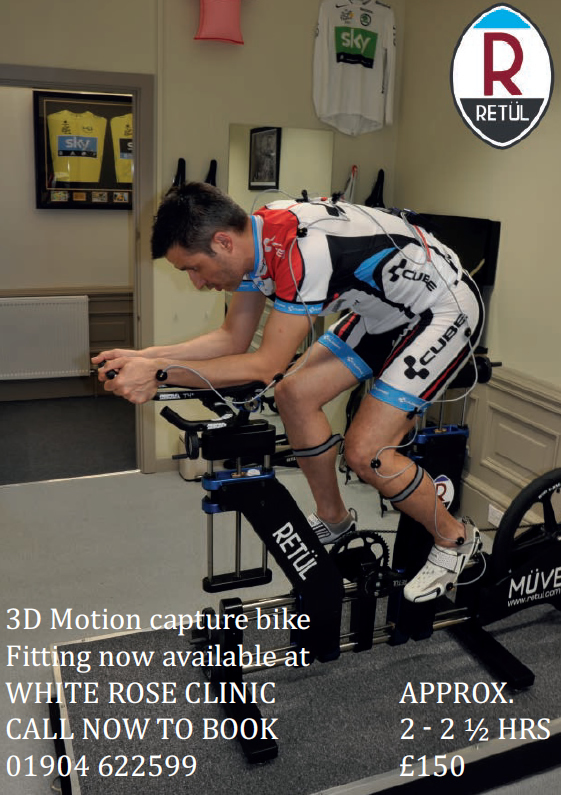 A report is generated, capturing all elements of the Bike Fit. We can compare pre and post fit data, and as your exact bike geometry and position is kept on file, should you purchase another bike, we can use these figures to replicate your fit.